Printable Black & White PDF Printable Color PDF More Paper Dolls & ClothesAt work, I dress in slacks, white shirts and cardigans, but at home I am a lover of maxi skirts and boho blouses. I love embroidery, texture and handmade looking details. I know some people manage to have a wardrobe that switches between “work” and “home”, but I’ve never really wanted that and would much rather just have a work wardrobe that I wear to work and a home wardrobe that I wear outside work. The point is I really like hippy/boho clothing and I knew I wanted to draw some for the blog. 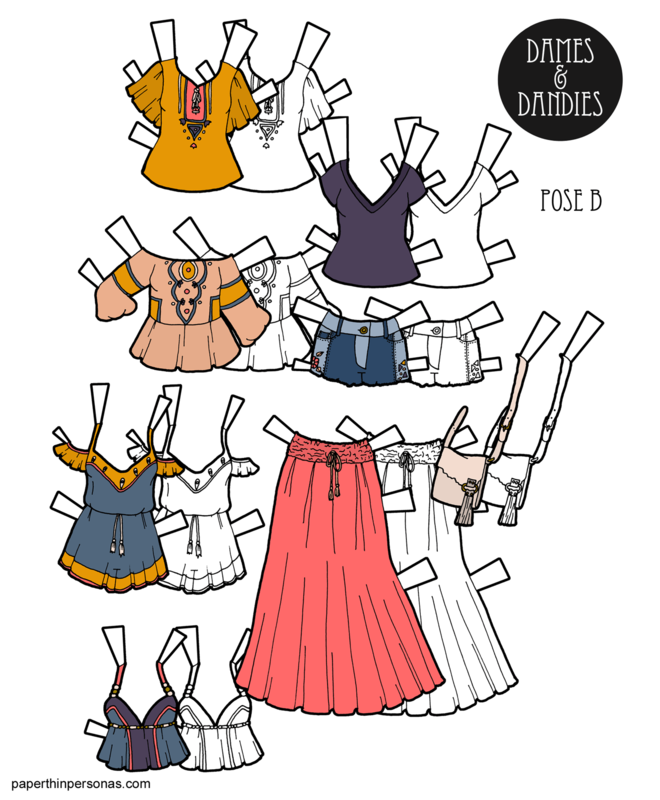 So, here’s a little paper doll boho mini-wardrobe of eight pieces of paper doll clothing. There’s four tops, two bottoms, a romper and a bag. That means (ignoring the bag), there’s about 9 clothing combinations or 18, if you count the bag. In the process of doing this, I also really got to thinking about what makes a Mini-Wardrobe and what just makes a paper doll outfit. I think the answers are: At least six pieces and more than one top and/or bottom. So, that’s my criteria going forward. I feel better when I have criteria. It is probably the librarian in me. If you have any questions about any of that, you can ask in a comment or through email. I’ll try to answer the best as I know (but I am not an internet privacy expert or a lawyer). Or you can let me know what you think of today’s post in a comment and to support the blog, think about donating through Patreon.